Access Church: Doing Life... Together. Some of us are already reflecting on 2009 and thinking about changes we'd like to make for 2010. If you aren't meeting weekly with a group of of people who encourage you and challenge you, why not make that a key priority for 2010? Few things could improve your quality of life more. Michael & Zoie Morales, Brad & Sherri Law, Ryan & Tina Dollar, Jeff & Ashley Hilley, and John & Christi Munns made that decision last spring, and it's been so cool to see their group develop. 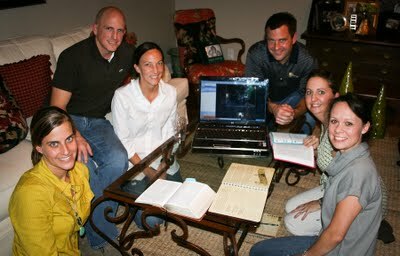 In fact, when Jeff was recently deployed to Guantanamo Bay, the group kept right on meeting--with Jeff on Skype! Each week Jeff joins the group via video chat, and participates in the entire discussion, live. The same group has a men's bible study every morning--via email. They each read the same few verses, then journal their thoughts and email them to each other. This allows everyone to participate regardless of schedule or location. So, this is not your mama's bible study group! These are real people juggling real-life responsibilities, but they have learned that being part of a group of others who are encouraging them along the way makes a huge difference. Join a group at GroupLink, next held on January 17. Click here to register today!